I was fishing for rock bass or perch with worms. I was using an old Zebco pole with a 202 Zebco reel, spooled with 8lb test line, with a no. 6 tru-turn hook. I got a bite and started to bring it in, still thinking I had a nice size rock bass on the hook. Suddenly, it became apparent that this wasn't a big bass and that I was hooked into something much bigger. I fought the fish for maybe about 5 minutes. 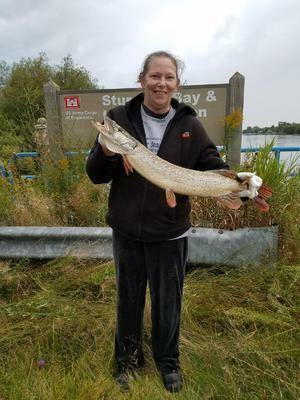 A person fishing next to me brought a net and helped me land this Northern Pike. 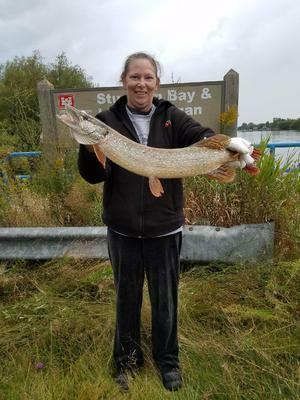 I estimate that it weighed around approximately 15-20 pounds.